Cabbage maggots feed on the roots of cole crops (broccoli, cabbage, cauliflower, brussels sprouts). The maggots destroy the roots and the plants wilt. Cabbage maggots were effectively controlled for several decades by applications of organophosphate insecticides. However, recent restrictions on the use of organophosphates have resulted in less effective control and reappearance of cabbage maggots as a severe pest of California cole crops. “Cabbage maggot is one of the most destructive pests of cruciferous crops in North America and Europe and has become the major persistent pest of cruciferous crops in the central coast of California. The value of cruciferous crops is estimated at ∼1 billion USD in California. In the Salinas Valley of California, cruciferous crops are grown in more than 34,398 ha and are valued at >$485.5 million USD. The majority of this acreage has been affected by cabbage maggot. Important crops that are at-risk from cabbage maggot include broccoli, cauliflower, cabbage, broccoli raab, and Brussels sprouts. 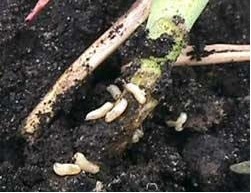 Cabbage maggot flies lay eggs in the soil around the base of the plant. A single female can lay about 300 eggs under laboratory conditions. Legless, 8-mm long white-maggots feed on the taproot and affect normal plant development. 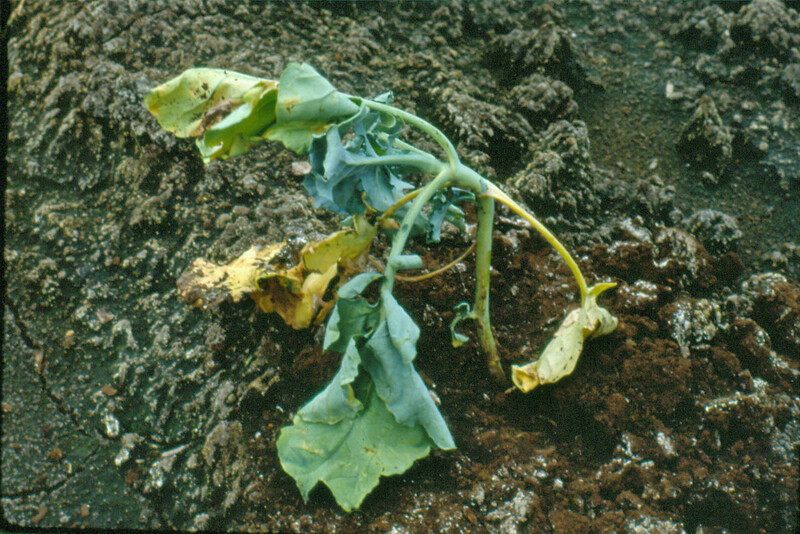 The most common above-ground feeding symptoms of cabbage maggot are yellowing, stunting and slow growth. Authors: Joseph, S. V., and J. Martinez. Affiliation: University of California Cooperative Extension. Title: Incidence of cabbage maggot (Diptera: Anthomyiidae) infestation and plant damage in seeded Brassica fields in California’s central coast. Source: Crop Protection. 2014. 62:72-78. This entry was posted in Insecticides and tagged Cabbage, Cabbage Maggots, cole crops, cruciferous crops, insecticides, organophosphate by pesticide guy. Bookmark the permalink.